Hello again everyone. I know it’s been a while since i’ve done one of these. But i’ve made a resolution to produce more content for the blogs I call home, so i decided to bring this column back from the dead, This is Patch Notes, my attempt at a news roundup for MMO and MOBA news. I will do my best to stick to a weekly schedule, but I make no promises. Bur for now, here are some of the top stories in the world of MMORPGS and MOBA games. Is it possible to go back to the World.....OF Warcraft? Well, that’s what MMORPG.com’s Paul Nadin is asking in this column. It’s the time of the year traditionally that people don’t care about anything. Everything interesting has happened, and there hasn’t been long enough for people to get their act together and stop going to the gym. My Christmas tree would still be up if it wasn’t for my wife tearing into it with a terrifying primal savagery. People say ‘is it still alright to say happy new year?’ because social conventions are a minefield and it would be awful to get it wrong and end up blown to bits in a shower of Caring Too Much. No one cares, but remember when we did care? Remember when the world was fresh and exciting? 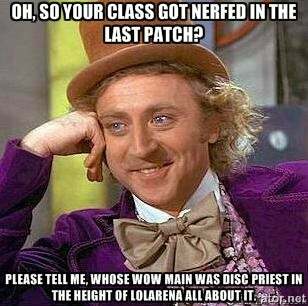 Remember when you didn’t know what the crit soft cap was? Remember when LFM, PST and WTS were all gibberish flotsam floating in Chuck Norris joke sea? I don’t, so I went back to where it all began, my World of Warcraft account. Are you an Old School Runescape player? Well get ready for new content. The continent of Zeah is coming as a thank you for loyal players during the 15th anniversary celebration. MMOsite.com has a report on what the new continent will offer. Bringing in the city of Great Kourend, this first section of Zeah lets players choose from one of five factions caught in an attritive fight for dominance across the metropolis. Allegiances then allow players to get reputation to unlock new content. To obtain new weapons and armour, you will be called upon to beat local criminal gangs, protect the city from the pervasive lizard man threat, and smuggle contraband onto the city’s streets. What’s more, you can play the mini-game of farming, mug the city’s inhabitants, and uncover the secrets of the necromancy spell book. Dungeons and Dragons Online joins that elite group of MMOs to reach the ten year mark. To celebrate they have a new race coming, the Deep Gnomes and a new dungeon full of references to the game’s history. You can read the full details over at Massivelyop.com or check out the devs production letter which goes over content added in 2015 as well as future plans. As announced at BlizzCon, 2016 kicks off the new Heroes of the Storm Global Championship Circuit. The best teams from Australia/New Zealand, China, Europe, Korea, Latin America, North America, Southeast Asia, and Taiwan will be competing in a seasonal format, with each of the three seasons—Spring, Summer, and Fall—culminating in a Global Championship event. In total, more than $4 million is on the line in the 2016 Global Championship Circuit. Full details can be found at the official HOTS site, including a worldwide schedule of events. You can get more details on the official Forum post. Lastly, let’s end this post with a Blizzard hat trick,. Back on January 13th, the alpha for Legion, the next expansion pack to World Of Warcraft came back online. The news came from the Twitter account of Arvaanas, Blizzard Quality Assurance Analyst. This is the list of known issues with the alpha as of January 13th. Well that’s all for this week. I want to thank mmorpg.com and massivelyop.com for providing most of the stories in Patch Notes. I will continue to monitor the world of MMO and MOBA games and compile some of the biggest stories of the week for next Wednesday’s Patch Notes.